COMMUNITY NEWS & REVIEWS: ‘OUR OWN HIGH SHERIFF’ - It is a pleasure to mention that our very own Ewhurst Green resident, Major General John Moore-Bick C.B.E. D.L. has now taken up the mantle of ‘High Sheriff of Sussex’. Having lead such a tough, and challenging life in his army career, including accidently blowing up the Dublin to Belfast railway line during his first command posting ! -travelling around the world and holding many difficult but rewarding commissions throughout his distinguished military career, maybe this will be a rather quieter role for John to undertake. This is an honorary, independent, non-political, royal appointment which covers just one year but with such a full, varied and busy schedule of official duties to uphold and attend all over the County, coming back home to life in a sleepy country village may seem rather idyllic, quiet and restful for both John and wife Anne. We offer our sincere congratulations and support to you both and look forward to following news of John’s ‘duties’ as he travels around meeting & greeting, talking and visiting with so many people, from all walks of life and in so many roles, from all around the County. Good Luck John (and Anne in her always supportive role) - and enjoy this new appointment. STAPLECROSS BOWLS CLUB: Settling into their 2018 Fixture List, our dedicated and keen members of our own local outdoor bowls club have several matches every week to keep them busy as well as fit and healthy throughout the season. This week begins with no less than four (4) matches being played throughout the week with a mixture of both ‘home’ and ‘away’ games for us to enjoy watching. The first match is being played on Saturday May 5th. This is a ‘home’ game against Fairlight beginning at 2.30pm. The following day Sunday May 6th May is the second of the ‘home’ games which sees our club playing against Hawkhurst also commences at 2.30pm. If you are in the vicinity of the club’s premises on Northiam Road, go along and show your support for our own local team. On Wednesday May 9th. the team will be playing the first of 2 ‘’away’ games for this week beginning with a match against the Sidley Martletts team. The last of the away matches for this week will be played on Thursday May 10th and our teams are to be found playing against a local club at Northiam. All these ‘away’ games will commence at 2.30pm. On a more light-hearted and sociable note, the Bowls Club are organising a “Race Night”. This is an annual event, and is to be held at the Staplecross Social Club, in Northiam Road, Staplecross on Saturday May 12th starting at 7.00pm. Entry is free, but if you wish to indulge in the delicious light supper that is available, at a meagre cost of £3:50 per person - then booking is essential. Please contact Brian on: 01580~830570 to reserve your meal choice. For more information on these matches and of any of the other social activities the Staplecross Bowls Club are organising, please contact them via email: simmonsm@talktalk.net or telephone Brian on:01580~830570. ROTHER RAMBLERS: Regardless of whatever Mother Nature throws at them, the members of this popular walking group, the Rother Ramblers still manage to get out and about and around our lovely countryside. Two more walks are arranged for us this week, sadly not that close to us, and Walk No:1 is planned to take place on Sunday May 6th. This is an 8.5 mile walk of Dene Park, Shipbourne and Oxen Hoath Park circular. The meeting point is at Dene Park car park OS.EXP 147. TQ605510. (satnav TN11 9RJ) at 10.00am. The walk notes states there are a lot of new paths and of course a picnic lunch is suggested as usual. Rita & Lionel are to be your ‘walk leaders’ for this meander and you may contact them on 01424~752452 for more information. 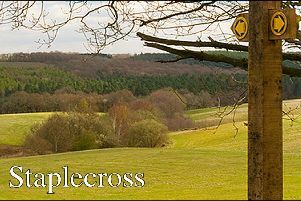 Walk No: 2 is organised for Sunday May13th and is an 8 mile circular walk from Broughton Lees, near Ashford, Kent. The meeting point is to be the village green, Boughton Lees. OS.EXP149. TR023473. (satnav TN25 4HH) at the usual time of 10.00am. The walk notes state “Please park considerately. A walk in the North Downs chalk hills, visiting Kings wood and Challock. There is one (1) relatively short, steep path uphill and a steep lane downhill. Remainder of the walk is through woodland and open countryside with far reaching views. Dogs are welcome to accompany you, but must sometimes be kept on a leash. Again, a picnic lunch is suggested. Wil is to be your ‘walk leader’ for this trip and you may contact him on: 01797~260417 or Mobile: 07801~189747 for more details. EAST SUSSEX MOBILE LIBRARY SERVICE: This week it will be the turn of Ewhurst Green to enjoy the services of this vital service. This will be the first of two visits this month, to the village and will arrive on Thursday May 10th. The van is due to arrive at 10.40am and will be departing at 11.10am.- so please ensure that you don’t miss it. The Library is about more than just books, so please come along and see for yourself and help keep this service going for the benefit of all who live in our outlying rural areas & perhaps cannot always easily access the Main Branch facilities. There are so many things of interest within the portals of this wonderful -and so far still free- Mobile Library Service vehicle,- so please come along and find out for yourself. EWHURST PARISH COUNCIL: Members of Ewhurst Parish Council, would like to invite you to come along to the regular monthly meeting of your local Parish Council. This meeting will take place on Thursday May 10th at 7.30pm and will be held this month in the Arthur Herdman Pavilion, Village Street, Ewhurst Green. This, like all council meetings, is open to the public, so please come along and have you say. Tell us about your concerns and talk to us about what you want to happen - or not happen - within our community. Put your questions to all levels of local government as representatives from Rother District Council and East Sussex County Council will hopefully, also be in attendance. We are always working hard on your behalf so please come and tell us how we’re doing, how we can improve, and how we can make living within this parish a happier and better place for us all. EWHURST, STAPLECROSS & BODIAM GARDEN SOCIETY: Following their successful and very enjoyable ‘Spring Flower Show of last month, the members and their guests, will be meeting up again for their usual monthly meeting which will take place on Thursday May 10th and will be held in the Village Hall, Northiam Road, Staplecross, TN32 5QG beginning at 7.30pm. This month the title of the talk will be “Woodland Gardening throughout the year and the talk will be given by Doctors Peter and Gillian Regan. These speakers are world travellers so this promises to be a very interesting talk indeed. These meetings are open to non-members for a miserly entrance fee of £3:00 per person and a very warm welcome is assured by all. To discover more of what’s planned for the rest of our horticultural calender, please contact Gill on:01580~830551 for details of events, outings, shows and details of membership. ( This offer includes a fantastic outing to WAKEHURST PLACE on Wednesday May 23rd. to enjoy the breathtaking displays of Rhododendrons and Azalea throughout these beautiful gardens.This visit is now extended to NON - MEMBERS so do contact Gill to book your seat on the coach! ) A warm welcome and a good day out awaits you. CHURCH SERVICES: A very warm welcome will be extended to the Archdeacon of Hastings, the Venerable Dr. Edward Dowler, who will be coming to preach at both St. James the Great in Ewhurst and St. Giles, in Bodiam today. Church services for the parish of Ewhurst, will commence at St. James the Great, Ewhurst Green on Sunday May 6th.Easter 6 at 9.30am. This service will include Holy Communion. (CW) A Family Service at St. Giles church, Bodiam will follow directly after at 11.15 am. and this service will also include Holy Communion.. There will be NO SERVICE TODAY at St. Mark’s church, Northiam Road, Staplecross. BUT - on Thursday May 10th. Ascension Day a special event will take place instead. Beginning at 11.00am. Open Day. 12.30pm Morning Prayer - followed by bread & Cheese Lunch - will be held at St. Mark’s church, Staplecross ONLY. If there is any church matter on which you feel you may need further assistance, especially Baptisms, Weddings and sadly, Funerals, then do please get in touch with the Priest - in - Charge, which is of course our new friend - Canon Christopher Irvine on 01580~830925. Help in some way is always at hand and always so generously given, so do please contact him. PLEASE CONTACT ME: Sadly, the weather which is more Winter-like than Spring-like - again - and certainly not conducive to thinking about outdoor Fetes or Fairs but if you are arranging an event in the foreseeable future, --- whatever the nature of the event and however large or small, or indoors or out, and you’d like some extra free coverage for it, -courtesy of the Observer Newspaper - then please get in touch. If it’s of interest to you, - it’s of interest to us. It’s never too early to send in any of the details and to tell us what you are planning. Many of you will be turning your thoughts to other events in the near future, as the longer - and hopefully warmer - days and evenings unfold, so please do contact me, as I’d love to hear from you and to help ‘spread the word’ on your behalf. ..........Thank You.